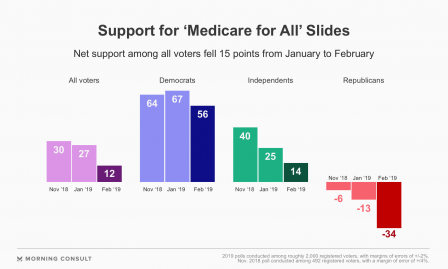 According to a new Morning Consult poll Medicare for All has plummeted in the polls, as the policy’s net support dropped 15 points from January to February. Medicare for All is a top liberal litmus test that nearly all 2020 hopefuls have attached their names to, including Kamala Harris, Bernie Sanders, Elizabeth Warren, Cory Booker, and Kirsten Gillibrand. Support for the far-left policy was cut in half when people learned they could lose their private health insurance. The drop came on the heels of both Kirsten Gillibrand and Kamala Harris touting their support for eliminating private insurance.